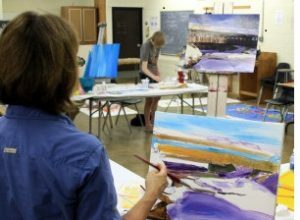 Learn more about Rosewood's art classes for kids and adults, special programs and summer camps. Learn about Community Art and Music like the Kettering Civic Band and Kettering Children's Theatre programs. Our Summer 2019 Camps Guide will be available online beginning March 2019. Camp Rosewood begins in May of each year and wraps up in early August! Enjoy fun, brand new camps for ages 5 – 15. To receive our camp brochure, please email rosewood@ketteringoh.org to be added to our mailing list. Camp Rosewood is a fun-filled, action-packed, summer of adventure, new experiences and lots of PLAY! Each week campers will enjoy art activities, creating and learning with artists, learning new skills, meeting new friends and building relationships with awesome role models for camp leaders. Both Kettering residents and nonresidents are welcome to enroll – don’t miss out! Jesy Anderson is the owner of Needle, Ink and Thread, located in Beavercreek. A sewing teacher and alterations specialist, she loves being creative and seeing her students succeed and build confidence with each project. Dale Archer co-owns Gemini Dance Studio and has spent several decades teaching dance for all ages and levels. Richard Begel has been a trombonist with the Dayton Philharmonic since 2003, and he is in Reload (rock/funk), Malarkey (jazz), Trombones of Dayton and The Greater Dayton Brass Ensemble. He has performed around the country and with the Canadian Brass, Ray Charles, Aretha Franklin, The Beach Boys, The Indigo Girls, The Temptations, Sarah McLachlan, John Pizzarelli, Arturo Sandoval and others. Rich teaches Music Technology, Music Appreciation and Low Brass at Sinclair Community College; and brass at a variety of other schools and colleges in the area. He is pleased to teach classes at the Rosewood Arts Centre! Cynthia Bornhorst-Winslow is a ceramics artist, who is new to the Rosewood faculty as of Spring 2017. She also serves as a faculty member and ceramics production assistant at Sinclair Community College. Nancy Boss is a multitalented and longtime instructor, who teaches a variety of youth and adult dance classes. She has been teaching various dance styles for decades, and began at Rosewood Arts Centre in 1985. She studied dance with Jorg Fasting from the Columbus Ballet Company and at Ballet Arts in New York City. Jason Boyer has been working in glass for over 15 years. He exhibits his work regularly in juried art festivals, including Art on the Commons in Kettering. David Brand and Sandra Picciano-Brand are a husband/wife team of Dayton-based jewelry artists. They exhibit at national-level juried art shows and have won numerous first place and best-of-show awards for their jewelry and sculpture. Jane Brennan holds a B.A. 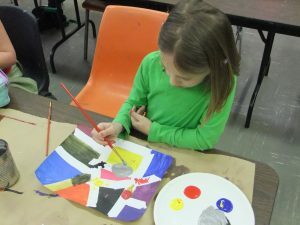 in Art Education from the University of Dayton. She has taught in a variety of settings and has experience in many art media. Shelly Burden began working with clay at Riverbend Art Center 1989. Her experience includes teaching classes at Greene County Career Center for 16 years. Kate Chesar studied ceramics at Kent State University and Shawnee State University. She was a member of the Yellow Springs Studio Tour and has taught classes in functional, decorative, and sculptural ceramics throughout the Miami Valley. Teresa Connair is a professional actress with credits in stage, television, movies and voice-overs. Since earning her B.F.A. in Acting from Wright State University, she has acted in and directed over 150 productions. She is the founder and director of her own theatre company, Undercroft Players, in Dayton Ohio. Teresa also teaches acting at the Oakwood Community Center. Mickie Cowan is a Dayton-based glass and jewelry artist. She attended the University of Dayton and currently teaches Rosewood’s Glass Bead Making classes. Andy Dailey earned a BFA from Wright State University and an MFA from Miami University. He is the Cultural Arts Program Supervisor at Rosewood Arts Centre. Greg Dearth graduated from Ohio University with a BFA. He is a member of the Portrait Society of America and has been a guest lecturer and instructor at the Columbus College of Art and Design and Atlanta’s Portfolio Center. His work has been included in many of the juried Society of Illustrators’ annual shows, Communication Arts, American Illustration and Print magazines. Allison M. Dickson has authored novels The Last Supper and Strings, as well as several dozen short stories. Her short stories have been published both independently and in magazines and anthologies, including Apex. Sammie Sue Edmondson has taught both youth and adult dance classes for the City of Kettering for over 30 years. She studied dance with the New York City Ballet, at Sinclair Community College and with renowned dance instructor, Jorg Fasting, of the Columbus Ballet. Shannon Fent has been Kettering Children’s Theatre’s director since 2007. She has Associate’s degree from Sinclair Community College in Theatre Production. Nicole Fiely is an artist and educator, who teaches a variety of Rosewood’s youth and adult classes and camps, including Printmaking and Screen Printing. She studied Fine Arts at Wright State University. Peter Frederick is a watercolor painter who illuminates the landscapes of Ohio, Pennsylvania, Indiana and Kentucky. Peter is a self-taught watercolorist with a background in graphic and landscape design. While known for distinctive sceneries, this Dayton artist has also ventured into abstraction with his painting series Abstract Contours. Sharon Govender has lived and worked in South Africa, earning a degree from the University of Durban, Westville. She studied painting, photography, Indian Art and African Art in addition to other art-related courses. Geanie Helfrich is an accomplished knitter with over 25 years’ experience playing with yarn. She has taught countless knitters from beginner to advanced. Geanie specializes in traditional Norwegian, Aran and Fair Isle knitting techniques. As well as being a freelance knitting teacher and designer, Geanie is an accomplished clarinetist and avid cyclist. Trish Jeffers-Zeh is an awarding winning artist, teacher and public speaker. Certified in PMC, Senior/ACW, she is dedicated to the advancement of metal clay arts. She also offers certification and mentoring of metal clay instructors. Her work has been shown internationally, sold in galleries, displayed in art museums, and she is a published author of instructional articles for magazines and other publications. Trish teaches nationally as well as through Rosewood Art Centre. David Kirchner has a degree in art from Cedarville College. He also studied at the School of the Art Institute of Chicago. David operates Vessels in downtown Dayton. He has worked in clay since 1984. Jess Kucinski leads the Art with Buddies program at Rosewood, which is designed especially for young children on the Autism Spectrum. Kucinski attended Wright State University and also teaches at We Care Arts, a Kettering organization that specializes in teaching clients with emotional and developmental disabilities. Donna Kuszpa studied wirewrapping with John Kleber in Columbus. Starting in 1993, she taught wirewrapping at Riverbend Arts Centre and currently teaches all the Wirewrapping for Jewelry courses at Rosewood. April Lemaster has been studying ceramics for over a decade. She has attended numerous workshops and conferences for ceramic techniques around the country. She has exhibited her ceramic work and received awards in the greater Dayton region. Tracy McElfresh aka Tracysews, is based in Kettering, Ohio. She loves custom sewing work, and dresses are her favorite. She is also a fit specialist, freelance writer, blogger and garment construction expert and a sewing instructor since 2004. Tracy also has a background in early education and has been working with children for over eight years. She is one of the former co-owners of Sew Dayton. Jes McMillan is a mosaic artist and founder of the Mosaic Institute of Greater Dayton. She has been creating artwork for over 16 years. Laura Ann Norris lives and works in Yellow Springs, where she enjoys combining art, nature and music into something beautiful. Her children’s classes will bring kids into a free-spirited world, where they can create and get really messy. She has degrees in fine art and pre-art therapy. Among her numerous creative endeavors, her latest passion is creating art in gardens and teaching art classes at Rosewood Art Centre. Jared Parker teaches Rosewood’s Photoshop classes. He currently serves as the Digital Design Tech Prep program instructor for Kettering City Schools. Mary Patterson has worked for over 40 years as a master goldsmith and artist. She received her BFA specializing in Crafts, from Bowling Green State University. She did graduate work at Wright State University, Miami University and Sinclair. Mary was an instructor at Riverbend for decades, taught classes at Rita Caz Jewelry Studio and continues to teach privately and to lecture on jewelry making across the state. Her goal as an instructor is to give back as much as she has been given by her past teachers and students. Laura Poplin is a nationally recognized silversmith and author. She enjoys sharing the jewelry making tricks and skills she’s gathered since making her first chainmail bracelet. Steven Powers teaches youth clay classes, including the popular Exploring Pottery Skills, but is always willing to pitch in and help with summer camps, too. A graduate of Sinclair Community College, he creates beautiful, functional ceramic pieces and also studied painting, drawing, sculpture and woodworking while at Sinclair. Loretta Puncer founded Gallery 510 Fine Art in 2007 as an initiative to culturally revive Dayton’s Historic Oregon District by creating a channel for local and regional artists, including herself, to display their work. Puncer’s paintings attract private collectors and patrons both locally and from across the country. In addition to managing the gallery and creating artwork of her own, she shares her passion for art through teaching a variety of classes and workshops both at Gallery 510 Fine Art, and Rosewood Arts Centre. She received her BFA from the University of Dayton. Kate Huser Santucci lives and makes art in Dayton, Ohio. She received her BFA in sculpture, but has since moved into mixed media and encaustic painting. Her current work incorporates drawing and printmaking techniques with wax and wood to create translucent layers and images. Kate is excited to be teaching again at Rosewood after many years! Barb Stork is a Dayton-based artist working in a variety of media. She serves on the faculty at Sinclair Community College. Sara Torgison received a BA in Studio Art with an emphasis in ceramics from Humboldt State University in 2010. She has worked as a studio potter and ceramics technician while developing her craft and creating strong ties with the visual arts community in the Miami Valley. Sara is currently the Ceramic Facilities Coordinator at Rosewood Art Centre and Resident Artist at John Bryan Community Pottery in Yellow Springs. Leonard Williams is best known for his vibrant watercolor scenes. His paintings have been recognized in numerous juried shows, both locally and nationally, featured in private and corporate collections across the country. His work can be seen in “The New Creative Artist” by well-known artist/author Nita Leland, and he is a featured artist in her book, Confident Color. In addition, his drawings appear in a series of learning and activity books for children in grades one through five produced by Children’s Historical Publishing. Sharon Williams began working with clay in college and has been involved with ceramics at Rosewood Arts Centre since 1992. Her experience includes classes with potters from Yellow Springs and the Greater Cincinnati Area. At Rosewood, Sharon has instructed preschoolers through adults in clay and arts. She has exhibited and sold pottery in the Tri-State Area. Kathy Woodruff is the co-owner of Busy Beaver Arts and Crafts and a glass art educator. 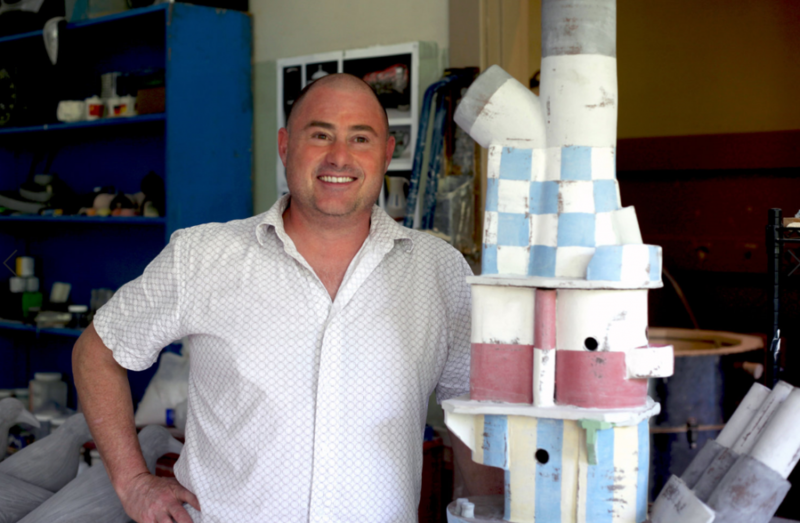 The City of Kettering’s Department of Parks, Recreation, and Cultural Arts’ Rosewood Arts Centre is pleased to announce that Dayton-based ceramic artist Arthur Kettner has been named as Rosewood’s inaugural Artist in Residence. Kettner is originally from Toledo, Ohio. He served four years in the United States Navy and developed a fascination with naval architecture. After graduating from Bowling Green State University in 2000, he earned an MFA from Tyler School of Art, Temple University in 2004. He became a laboratory technician for Glass Coatings and Concepts, Laguna Clay and Mayco and traveled to China for Longaberger Co. Past achievements include helping to create the Zanesville Prize for Contemporary Ceramics, building the program at Pioneer School of Zanesville, and developing a maker space for Zane State College. Kettner moved to Dayton in 2018 and has helped to create the Artist in Residence program at Rosewood. He is the program’s first participant. In addition to creating work in his studio onsite and assisting with clay studio operations, Kettner will engage with Rosewood students and the public to share his knowledge of ceramics. Everyone is welcome to join our Artist in Residence for a series of casual "Coffee and Clay" sessions. Each session will be a loosely structured, short-session demonstration or micro-workshop focused on a different ceramic technique. Pre-register to reserve a spot or pay the drop-in fee on the day of the workshop to attend. The fee to attend is $4 for Kettering residents and $8 nonresidents. Participants should bring their own clay and tools, and coffee is provided. A solo exhibition in Rosewood Gallery featuring Kettner’s work is scheduled for Spring 2020. More details will be released with the next gallery season announcement. Email rosewood@ketteringoh.org to be added to the list to receive gallery updates.